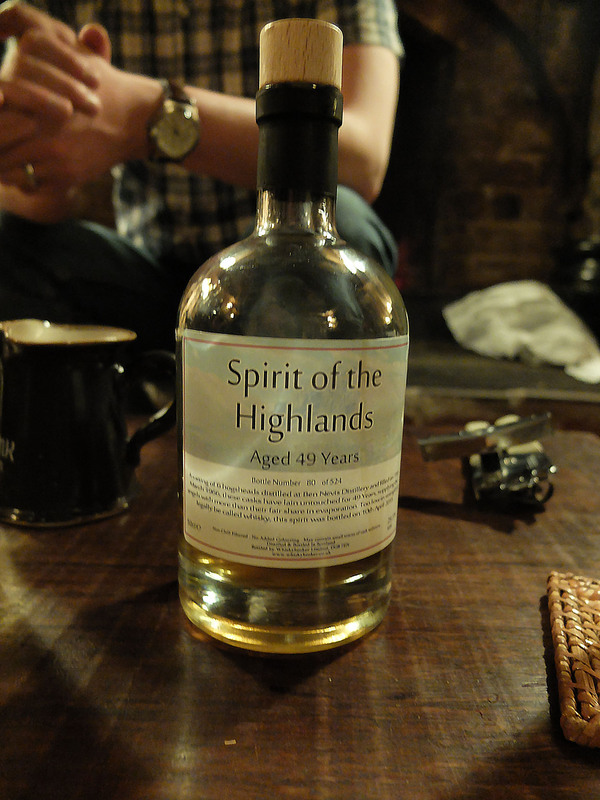 It was our 5th Birthday and we de-camped to a cottage in Glenshee to sit by the fire and sample a couple of special bottles. Would they stand up to the test? We got this bottle from the Cadenhead's shop on the Royal Mile in Edinburgh, and it was part of the private collection of Hedley Wright, the head honcho of Sprinkbank - seemed a worthy story for our 5th Birthday celebrations! - "If i were going to stick any firework up my arse, it would be a roman candle - so it looks like you're pooping fire"
- A catherine wheel arse engineering project would just leave you dangling by a nail on the shed whilst being burnt horifically"
I'm hopefully there was a sort of firework / gunpowder smell in there somewhere, but I fear we digressed beyond the bounds of a useful review. So, back to it: Apple strudel, cola cubes, pecan pie. The suggested accompanying music was either Doorstep Fresh (2nd in York's Inter-school Battle of the Bands Over 16s Competition) or JUST the intro of House by the Cemetery by Mortician. There was some 'cotten fresh' fabric softener and a fear of nectarines, mixed with Marlenka (? honey cake, apparently), honey-soaked crumpets and "bums & balls" - suggested to be a Chas & Dave song). 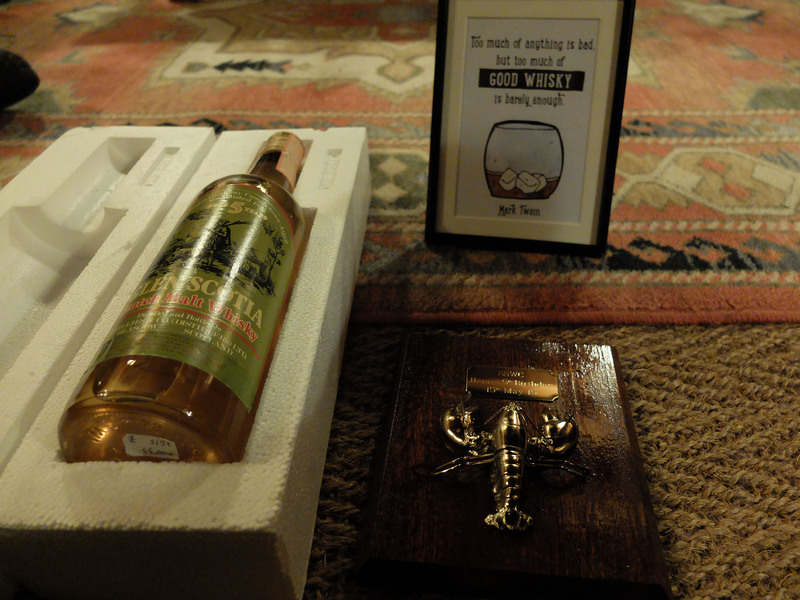 It was said to "smell great" and "nice" and "like a whisky I'd like". And finally, perhaps because it has little bedfellows on the nose, perhaps exclusing the Mortician 'song': blood. After one of the more interesting noses we've described, what will we find on the nose? Well, it starts off lemony with lemon turkish delight, syrup from tinned mandarins with honey and sweetness. It was decsribed as "so nice", "really happy if I got this in a pub", "reallt nice" and "not what I'd expected". So, a mixed bag, perhaps - Less seasidey, "decadent" and a cigar with no smoke. It reminded one of a medieval drinking hole, in a good way. Mead. 'Meadium'. Sour, sweet and sour (yeah?). It was then compared to when you smell a sherry and it's really sweet but it tastes really dry. "All high notes, but no base". It was generally seen as quite balanced, with a spice to it - but what spice? All spice? Cinnamon? Anice (not star)? It was also noted as metallic, with rhubard crumble and sour rhubarb, with quite a lot of zip. The suggestion of sour cherries was confirmed with, "good shout, totally plausible", then the suggestion of sour marzipan was met with no response. In summary, spicy and dry. "I reckon we'd identify this blind as a Sprinbank". "I reckon we wouldn't". 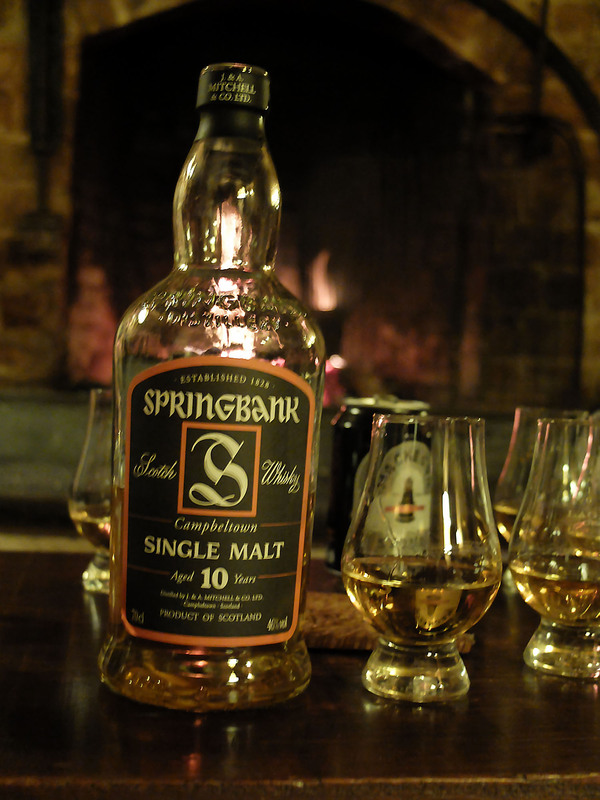 "Not unlike the current springbank 10yo to be honest, in fact exactly the same". The finish was sherberty (lemon sherberrrrrrtt) with Kimchee and K-pop. There was a compliment for a taster's arse, a suggestion of sherry and one was pretty 'jazzed' by it.